As we enjoy running the dog swim spa so much we thought we'd make the pool kits available as an ideal business opportunity for a couple or as an addition to a kennels, physiotherapist or breeder. We fabricate dog swim spa kits to meet your requirements. This is not a franchise, we supply the kit only. You build your business at the pace you wish and as a condition of purchase we ask you to come to Christchurch to see how it operates and talk to our clients. Click here to enquire about our fabricated dog swim spa kits. Dog Swim Spa is a custom made dog swimming/spa pool built on our 10 acre property in Templeton, Christchurch, only 6km from Hornby Mall. We thought the dog swim spa was a great idea for our aging German Shepherds after seeing them get stiff and sore in their back legs. When we finally decided to build it in 2008 we knew our dogs would not be content to be put on a hoist and made to swim in one place, so we made our pool slightly bigger at six metres long, which was larger than the others we had seen. Your dog can actually swim and feel like it is getting somewhere. Our pool is designed so we do not need to get in with your dog. This way we have more control and we don't encroach into "their space". We have had several visiting hydro therapists tell us this is a great concept and a great canine facility. The pool is specially constructed to be able to deal with large dogs diving in and has withstood several large earthquakes!! Originally built for our own use, several people thought it was such a good idea that others would want to use it, so we have opened it up for dog owners who wish to gain the benefits of it. 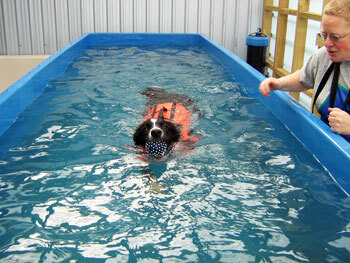 We have swum dogs ranging from west highland terriers, poodles and bichons - to border collies and rottweilers. This is an owner 'hands on' concept so bring old clothes and be prepared to get wet! The first session is only $30.00 so you can be sure your dog enjoys it. The results speak for themselves. See our K9 testimonials page.